Chuck Gallery is delighted to present an intriguing new collection of paintings from Christopher Ankeli. 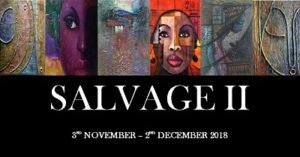 A contemporary mixed media African artist, Christopher will debut a passionate and enthralling body of works in celebration of his first solo outing in the gallery. Drawing inspiration from the northern part of Nigeria where he was born, he will explore various elements pertaining to African life. A lover of found objects and materials, Ankeli’s collection will feature colourful landscapes interwoven with the eccentricities of seasonal African climates, vibrant townships heaving with the excitement of rural life and feminine forms distinctive of Ankeli’s style. Ankeli graduated with a Higher National Diploma in painting from Kano State Polytechnic in 2003 and has had the privilege of working under some renowned names in the northern art scene including a period of tutelage under Professor Tony Okpe, professor of sculpture at the Ahmadu Bello University. His northern roots influence his art practice, especially in his landscape paintings. His influences also stem from the loss of his mother, channelling this tragedy to create paintings that communicate strength, resilience and character. Expect a combination of paint and unconventional materials on canvas. View his full biography here. The launch of the exhibition will take place on Saturday, the 3rd of November with the exhibition continuing throughout the month of November following the official launch. Special private viewing events by appointment only where the collection will be explored in greater detail will also be taking place throughout the duration of the exhibition. If you would like an invitation to a private viewing for yourself and/or guest(s) please contact the gallery – chuckgallery@outlook.com.